It’s clear from Part 2 in our series that Hubbard’s brief time in Australia was a disaster, and certainly a far cry from both his and Scientology’s narrative of his single handedly saving our Antipodean allies from the ravages of Imperial Japan. If anything, the record demonstrates that he was considered a self-aggrandizing nuisance incapable of executing the few tasks he was given; his response to charges of incompetence reflects what would be a pattern throughout his life, wherein he would never admit fault or would blame others for his own failings, shirking responsibility wherever possible. “I was flown in from the South Pacific as the first casualty to be shipped out of the South Pacific war back to the States. The war had been started in Pearl Harbor, and I’d been down in the South Pacific and – a lot of things happened down there. And the outfits down there were pretty well wiped out, as you can remember before the US and Great Britain started to fight and go back in. All right. Most of the guys that were shipped out of there who had been wounded, were shipped out by slow boat. And I didn’t, I wasn’t that seriously done in. I hooked a ride on the Secretary of the Navy’s plane; produced the right set of orders (I hope nobody ever kept them on file) and got flown home.” Hubbard, L. Ron (1956-02-07). The Game of Life (Exteriorization and Havingness). Los Angeles, CA: Golden Era Productions. Hubbard, L. Ron (1956-11-08). Definition of Organisation, Part I. Los Angeles, CA: Golden Era Productions. This memo is important for a couple of things. First, it establishes that Hubbard had a more direct level of supervision than first thought, given that he had a local officer above him in Brisbane. This supervision was in addition to Cdr. Causey in Melbourne, and we now also have proof of an actual physical naval duty station of Australasia Chambers, 406 Queen Street, Brisbane. It’s usually stated that his only documented “duty station” per se was at Camp Ascot under Army Engineer Col. Johnson. This evidence of a direct command structure can lay to rest much of the myth of Hubbard operating completely independent of any authority while in Brisbane; it still does not account for his complete disdain for authority, nor his constant self-aggrandizement. It should be further noted that military units hold a “muster” or roll call every duty day, and if a member is on temporary active duty (TDY) away from a parent unit, they still must account for that member’s whereabouts via the TDY command. So while Hubbard may have not boarded the Chaumont, his whereabouts were accounted for; it’s most likely a case where he couldn’t be accommodated on the Chaumont, having been superseded by a senior officer or there simply wasn’t enough berthing. Brisbane was not a chaotic combat post; the ability to track Hubbard administratively wouldn’t have been that difficult. Certainly as a naval officer, he would have been readily identifiable as more the exception than the rule, given the huge Army presence in Brisbane at the time; more so, if the Navy could track him down over an overdue tailor’s bill, they could certainly locate him to ensure he had indeed left Brisbane. “I hooked a ride on the Secretary of the Navy’s plane; produced the right set of orders (I hope nobody ever kept them on file) and got flown home. Let’s first set aside the absurdity that then-Secretary of the Navy Frank Knox would entertain a call from some unknown Lt. (jg) in Brisbane, Australia. We’ll also set aside the absurd notion that rather than encrypting and using secure, reliable fleet radio links, someone has decided to use Hubbard as a courier for potentially war-winning intel. Electrons are always faster than aircraft, so why take the risk of having some flunky schlepp a bunch of Top Secret paperwork across the Pacific? In other communications absurdities, let’s also consider the fact that international long-distance telephone calls were problematic at the time, let alone the fact there was no direct link from Australia to Washington, DC during wartime to do so anyway. The circuits available were very tightly controlled, so one just didn’t pick-up the phone and call the War Department and ask for the Secretary of the Navy. What’s more, is why didn’t super-spy Hubbard use a secure, expedient naval communications medium, rather than the rather quaint telephone to contact Sec. Knox? So having allegedly having conversed with Sec. Knox, Hubbard somehow convinces him to send a plane to retrieve our young Lt. (jg). 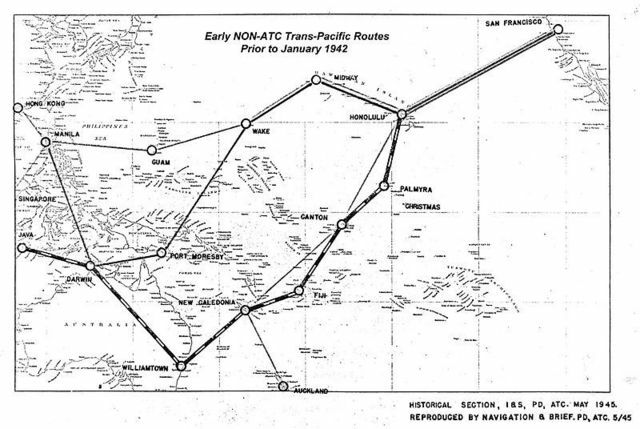 This is where it really gets complicated, so let’s first look at the state of the art of long-distance flying in the Pacific in March of 1942. Frank Knox and Lieutenant who? Frank Knox was an incredibly dedicated Secretary of the Navy. A newspaper tycoon before the war, he brought a tireless enthusiasm to his civil service, traveling an impressive 141,000 miles to far-flung naval installations across the world before his death in 1944. He oversaw the largest expansion of US Naval power in history, a result of his visionary “Two-Ocean Navy” strategy. 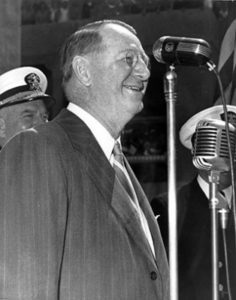 In early 1942, Knox was engaged in a nationwide speaking tour to promote his naval vision. At the time that Hubbard supposedly would have been calling, he was visiting midwestern war plants and making speeches to a variety of civic and government organizations. One wonders where he would have found the time to take a call from an unknown Lieutenant such as Hubbard, much less how Hubbard would have even known where to find him! Then there’s the question of his airplane. We know that Martin Clippers weren’t available in Brisbane at the time in question, even to the Secretary of the Navy. More so, given Japanese air superiority in the region at the time, it’s highly unlikely that had Sec. Knox even been remotely close to Australia, he would have arrived via a heavily armed, fast naval convoy and not by air. Knox and Hubbard; Whoda thought? This proves nothing other than that at one point Hubbard sent Knox a letter, most likely regarding his problems getting commissioned or some other similar gripe. Such logs are common and are in some cases required by law for senior government officials. An entry here in no way establishes the existence of a personal relationship, especially if there is no record of reply correspondence from Knox. If one allowed a mail log to be proof of a relationship, one could easily conclude that Knox personally corresponded with everyone listed in this rather voluminous compilation! What’s of further interest is that there’s no rank or naval affiliation listed in Hubbard’s entry, just his Explorer’s Club address, which then begs the question, in what capacity was he writing Knox? Knox was an incredibly busy man in early 1942, so given all his obligations, there’s no way Hubbard had any sort of personal relationship with Knox in any capacity, certainly not to the extent where Knox would have arranged expedited air transportation for our hero. 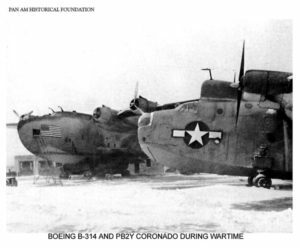 Lake stubbornly runs with the friendship narrative, and states that with Knox’s help, Hubbard most likely took the Philippine Clipper stateside, one of the remaining two Martin M-130s then in service. Both the timeline and the documentation she provides support a claim for Hubbard’s Clipper travel, but only from Honolulu to San Francisco on March 23, 1942. Her contention that Hubbard flew all the way from Brisbane is predicated by the fact that she and other revisionists believe that Hubbard boarded the M.V. Pennant in Brisbane on March 9th, and in convoy along with the USS New Orleans, sailed with her only as far as the next port of call, Noumea in New Caledonia, which was indeed a Clipper stop for the Honolulu Clipper, a Boeing 314. 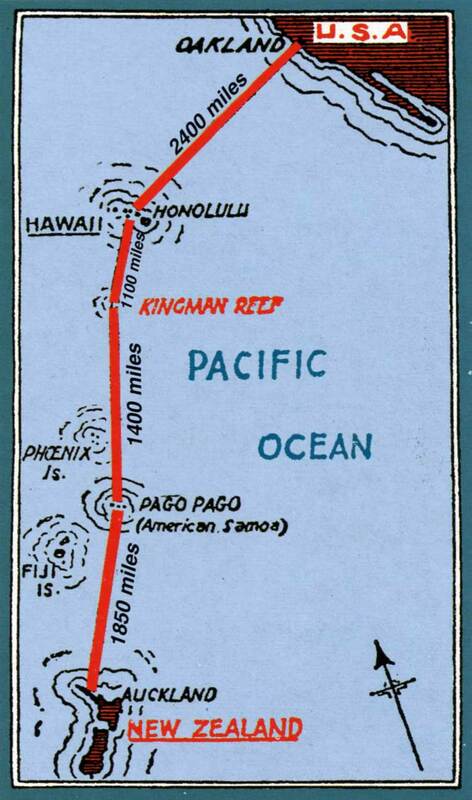 She suggests that Hubbard could have somehow caught a ride on the Philippine Clipper from here back to California, despite the fact that she was only flying between San Francisco and Honolulu at the time. 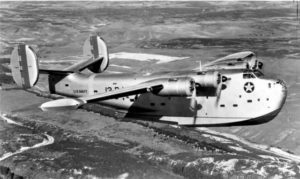 Ms. Lake also does not account for how Hubbard would have arranged a ride on the Philippine Clipper in Noumea, simply stating that given the 14-day window between Hubbard’s departure from Brisbane and his arrival in San Francisco could only have been accommodated by air. You’ll remember that Pan American operated only 3 Martin M-130 Clippers. 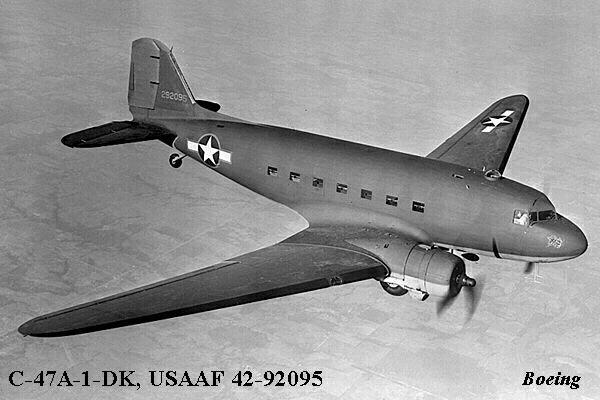 Up until 1948, aircraft in the United States were identified by using first the letter “N” if involved in “foreign air commerce display” and next, by a series of airworthiness identifiers, for example, “C” for a standard airframe, (versus “X” for experimental, etc.). Thus the Martin Pan American Clippers were identified respectively as the Hawaiian Clipper (NC-14714), the Philippine Clipper (NC-14715), and the China Clipper (NC-14716). This registration number was different than the manufacturer’s serial number, which was a three-digit number, for example the Martin serial number for the China Clipper was S/N-558. 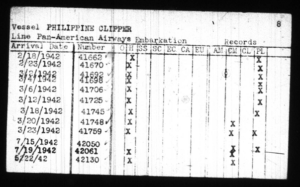 “ “PHILIPPINE CLIPPER” airplane records in “Index to Vessels Arriving in San Francisco, 1882-1957”, Microfilm Publication Number M1437, Record Group 85, National Archives. “CHINA CLIPPER” airplane passenger records, 22-Apr-1942, showing US Navy Admiral Chester Nimitz aboard, “Passenger Lists of Airplanes Departing from Honolulu, Hawaii, January 27, 1942-July 1, 1948”, Microfilm Publication Number A3392, Record Group 85, National Archives; also available online at ancestry.com. “YANKEE CLIPPER” airplaine (sic) passenger records, 8-Mar-1942, showing US Navy Admiral Thomas Hart aboard, “Passenger and Crew Lists of Vessels Arriving at New York, New York, 1897-1957”, Microfilm Publication Number T715, Record Group 85, National Archives; also available online at ancestry.com. Why does Lake Flub Hubb’s Homecoming? Let’s take reference #51 first. A careful examination of the 4 “Index to Vessels” cards, numbered 6 through 9, shows that the number she refers to as linking the Philippine Clipper to Hubbard does nothing of the sort. Ironically, she appears to ignore that on card #6, the first in the series, that the Philippine Clipper’s tail number, NC-14714, is listed in the upper right hand corner. It’s a mystery why she would create some spurious linkage using the number 41759, given she has the correct airframe identifier. Using the correct NC number as provided in card #6, she could have shown that the Philippine Clipper did indeed arrive on March 23 by linking the two, though she has no proof Hubbard was aboard; however this listing would appear to support the circumstances of his arrival in San Francisco relative to our 14-day timeline. The data here also does not support his use of Knox’s own airplane, nor a Martin Clipper flight originating in Noumea or anywhere else in the Southwest Pacific. Furthermore, we know that the Philippine Clipper flew to Noumea, New Caledonia only during the pre-war years. 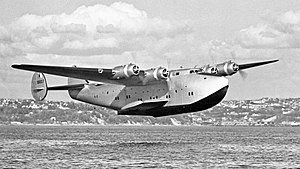 Since returning to San Francisco from Wake on December 10th, 1941, she had been restricted to servicing San Francisco from Honolulu. According to government immigration archives, the number Ms. Lake references actually indicates the immigration file reference for the specific passenger manifest of the vessel in question on that arrival date. I can find no other explanation for this number’s significance anywhere nor an explanation of the codes to the right of the “Number”. As to other possible explanations for this number, an examination of Pan American’s Pacific Clipper route guides and schedule information for 1941-42 reference no flight numbers, just dates, times and destinations, so there’s no correlation in this regard either. 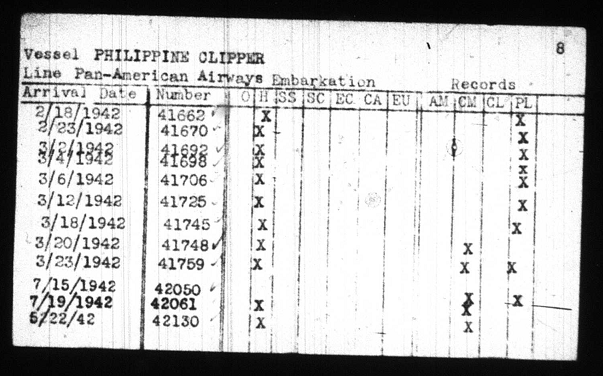 Lastly, none of these numbers correlate to any Martin M-130 airframe, let alone the Philippine Clipper, save for the single NC entry at the top of card #6. The Hawaiian Clipper, NC-14714, had by this time already been lost over the Pacific east of Manila on July 29th, 1938; her sister, the China Clipper would be lost near Port of Spain, Trinidad on January 8th, 1945. 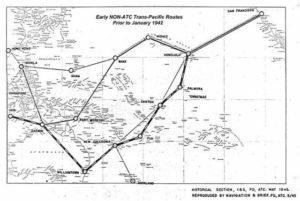 Interestingly, the Philippine Clipper was extensively damaged by Japanese strafing at Wake Island on December 7th, and was able to limp back to Honolulu, and after a brief layover eventually arrived back in San Francisco on December 10th, 1941. While she would continue to fly back and forth to Honolulu from San Francisco, she would never again fly to the Philippines or other Far East destinations. Sadly, she eventually crashed into a mountain top north of San Francisco on January 21st, 1943, marking the end of a significant chapter in aviation history. References #52, #53, and #54 are also misleading. 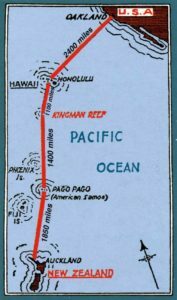 While Nimitz may have indeed flown on an M-130 (#51), he was flying from Honolulu back to the mainland, and not further on towards a South Pacific destination. An M-130, the China Clipper was no longer used for trans-Pacific flight by this time. 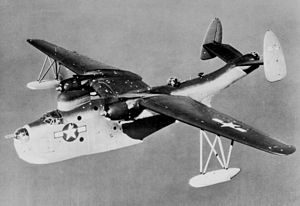 Nimitz would have used a Boeing 314 or more than likely, an armed Martin variant to fly to Australia or other destination in the Central Pacific. While the M-130s were part of the Navy fleet, they were not used to “fly senior officers and the occasional intelligence officer on trans-oceanic trips and missions”(#53, #54); they flew exclusively between Honolulu and the West coast. They were also used right after Pearl Harbor in a vital series of flights to evacuate the dependents of VIPs because of concerns of further Japanese attacks. Significantly, the passenger lists she refers to here in these references are from East coast Clipper flights. The Yankee Clipper, NC-18603, crashed in Lisbon in 1943, and NC-18606, American Clipper, served over the Atlantic throughout the war and was scrapped in 1950; how these lists support her thesis is not readily apparent. 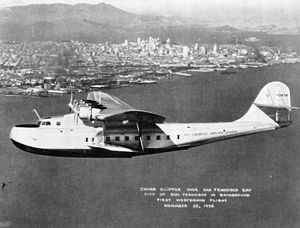 As we’ve explained, the China Clipper and her sister served as shuttles to and from the West coast to Honolulu, but certainly not beyond Hawaii; this was strictly the domain of the Martin and Coronado flying boats and the Honolulu Clipper, and later, the huge R5D fleet. She’s essentially comparing apples to oranges here, and is playing loose with the facts when she needn’t. In partially rubbishing the “return by air” theory, let’s examine the more likely possibility of a ship-borne return for part of the journey. Lake says that it would have been “physically impossible” for Hubbard to have made it to San Francisco from Brisbane in 14 days via ship, which is correct. Glen W. Williford, writing in Racing the Sunrise: Reinforcing America’s Pacific Outposts, 1941-1942, states that a fully-laden M.V. Pennant, with a top speed of 18 knots, was capable of maintaining 16 knots during an unescorted voyage to Manila in October of 1941. According to the USS New Orleans’ war diary, she, the USS Mugford, the SS Pennant and the SS Perida were to rendezvous with convoy ZK7 and then sail to New Caledonia, where they arrived on March 12. Hubbard was held in high regard by his Army commanding officer in Australia (see “Combat” section). Hubbard was in an area which may have involved him in combat in and/or taken him north of Australia (see “Combat” section). Hubbard was injured while in Australia or somewhere in the South Pacific region (see “Injured” section). Hubbard was involved with counter-espionage work for the Navy towards the end of his time in Australia (see next section). Most, if not all of these “compelling reasons” are pretty mundane and certainly don’t reflect any strategic urgency for Hubbard’s expeditious return to San Francisco. If anything, they serve to reinforce the implausible nature of the entire scenario, as no legitimate command would have authorized the use of such a significant resource for an undistinguished personage such as Hubbard. We know from the notation in Hubbard’s medical file that Hubbard stated his catarrhal fever “came on” four days before his arrival In San Francisco from Honolulu. If for argument’s sake, he had flown to Honolulu from New Caledonia, why did he not seek treatment at a navy medical facility in Pearl Harbor? Had he been ashore for more than 24 hours, he would have needed to report to the transportation officer as being “in transit” to avoid being AWOL; if he’d had a significant lay-over as a result of the time saved having flown, there would have been an entry in his records reflecting this. The impossibility of squaring the Clipper fable continues, in that having arrived in Honolulu via “a Clipper,” we have no record of Hubbard billeting ashore in between legs, certainly not as a guest of Frank Knox; Ms. Lake also implies that Hubbard had to have flown as he does not appear on the M.V. 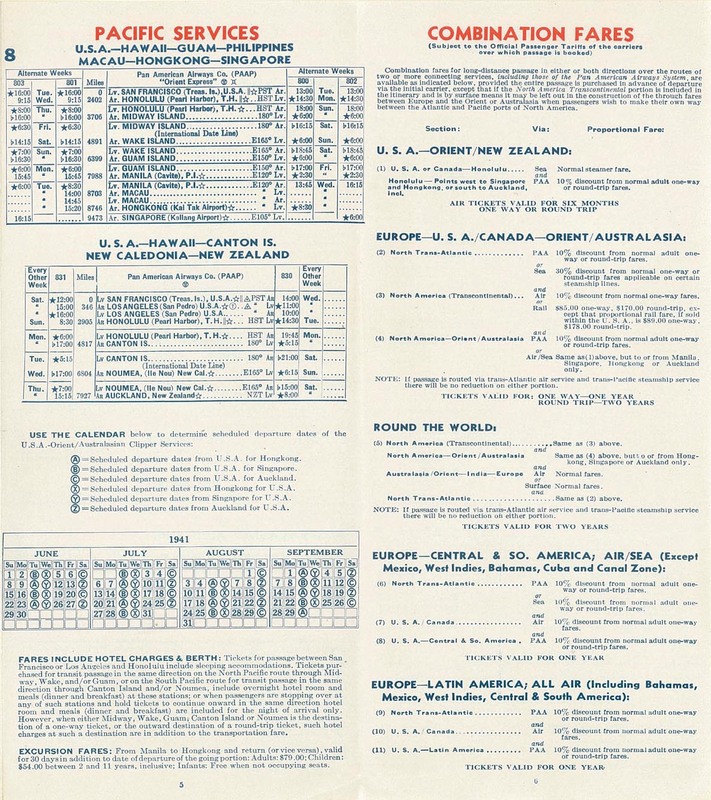 Pennant’s passenger manifest, though this was not uncommon during the war, and does nothing to further her Noumea to Honolulu flight thesis. Hubbard’s absence from the Pennant’s manifest is a red herring. The fact that we have the memo from the Naval Observer in Brisbane stating he has information of Hubbard’s having boarded the Pennant is sufficient. He most likely cabled Washington for clarification as to Hubbard’s status, rather than attempting to contact the Pennant. The Bureau of Navigation was the final authority on a person’s whereabouts and in 1942, was redesignated as the Bureau of Personnel, given that it had been tasked with personnel management since 1889. The Brisbane memo is addressed to the Bureau of Navigation with the knowledge that they would be able to locate Lt. (jg) Hubbard to settle his debt, and again, also provides administrative proof of Hubbard being aboard the Pennant from Brisbane. “Most of the guys that were shipped out of there who had been wounded, were shipped out by slow boat. And I didn’t, I wasn’t that seriously done in. I hooked a ride on the Secretary of Navy’s plane; produced the right set of orders (I hope nobody ever kept them on file) and got flown home. And when I got home, they turned me in to the hospital.” — Hubbard, L. Ron (1956-02-07). The Game of Life (Exteriorization and Havingness). Los Angeles, CA: Golden Era Productions. Hubbard had the means, motive, and opportunity to create false travel orders while in Brisbane. He was working within a significant headquarters and administrative complex, and could have easily stolen hard copies of the necessary forms, endorsements, and travel vouchers needed to create his fraudulent documents and “produce the right set of orders.” He’s cagey here, in that the way he phrases this, he’s trying to give the impression that he had somehow legitimately obtained passage, yet he turns right around and says he hopes “no one kept them on file.” Such is the typical Hubbard “humbrag”. In “producing” the right orders, Hubbard would have had access to the necessary stamps and official stationary that would have legitimized his travel credentials; it’s easy to visualize him creeping into the admin area after hours, and furtively searching for all sorts of “official” stamps and whatnot. Given his role as naval observer and intelligence officer, Hubbard would have been exposed to a variety of different order formats, and understood their degree of sensitivity/clout and their respective hierarchy; from this insider knowledge, he would have known how to give his fakes the right official ‘look and feel”. Couple this with his bluster and sense of entitlement, and it becomes readily apparent that once in Honolulu, he was perfectly capable of manipulating his way into a scarce seat on the Philippine Clipper. The whole sorry saga reflects Hubbard’s megalomania, dishonesty, hubris and cowardice. Ms. Lake demonstrates flashes of brilliance in her research and document acquisition, yet she and her fellow Hubbard and Scientology apologists all completely overlook just how appalling Hubbard’s actions were in getting home from Honolulu. The was a legitimate fear of further Japanese attacks, even invasion, and it was imperative that the families of civilian and military VIPs were expeditiously evacuated to prevent being held hostage by the Japanese. Hubbard completely ignores this reality, thinking only of himself and that he was above the common sailor, thus a transport ship home was for the unworthy. To me, it demonstrates his cowardice in not wanting to face a sea journey through Japanese submarine infested waters, as well as an abject disdain for the seriousness of the situation. While falsifying orders is a serious crime, cowardice in the face of the enemy is perhaps the ultimate betrayal of the warrior ethos. It’s clear Hubbard was no hero, nor great covert operator, though at the beginning of this series, I gave him credit for having honorably served. Having now dug into his criminal behavior while an officer, and more so, his betrayal of those dependents and other citizens he swore to protect, his behavior up to this point is simply disgusting. It would be one thing to fake orders home after serving in combat and then taking the normal route home. Hubbard lies about being wounded, lies about being important enough to obtain expedited travel home, and worst of all, in perpetrating his his fraud, he most assuredly was responsible for stealing a seat on this flight from some dependent, VIP or other person more vital to the war effort than he, all for vanity’s sake. In Part 4, we’ll continue our deconstruction of Hubbard’s WWII claims, starting with his arrival at the US Naval Hospital at Mare Island, Vallejo, CA on March 23rd, 1942. Next Next post: Will GDPR Really be Scientology’s Achilles Heel?